My major deliverable this week was to create all the hair and fur systems for Dyer and Danforth. I created hair cap geometry for the characters’ hair, eyebrows, hat and upper lip, then ended up using a few different methods for hair generation,. 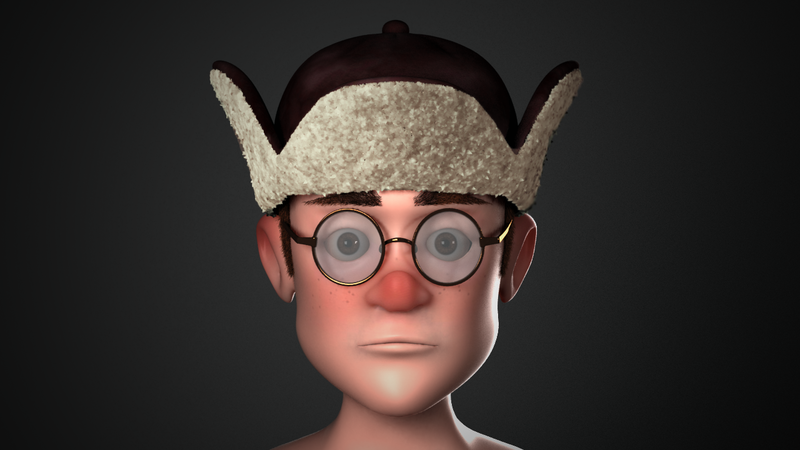 For Danforth’s eyebrows, hair and furry hat, I used VRay fur. VRay fur renders very quickly and is easy to work with, but does not feature any artisan grooming tools and relies on ramps for styling. 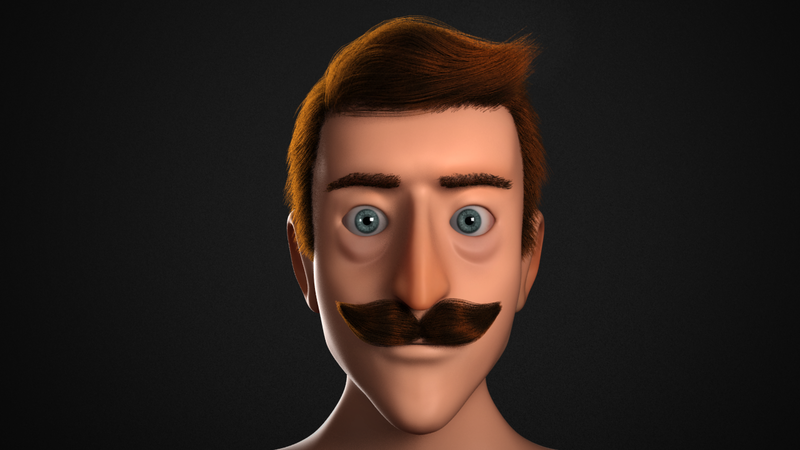 VRay fur also can’t be simulated, so it’s best used for very short hair that can be animated with noise. 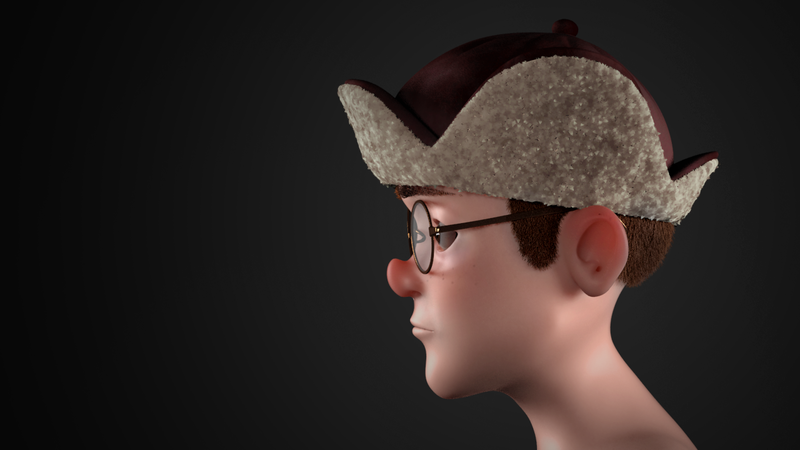 I used a VrayHairMtl3 shader for the hair and eyebrows and a VRayFastSSS2 shader for the hat fluff. Positive Stuff: For a first pass, I’m pretty happy with this! The eyes can use a bit more scruffiness and his sideburns need a more natural taper, but those are easy fixes. Problems / issues: Still not happy with the hat fluff. For some reason, even when I crank up the sides on the VRay fur, the hat fluff still seems triangulated when close up. It works nicely for ranged shots, though. We’re also looking to see if the SSS shader can be substituted with a hair material with very high transmission to save on render times, but we’ve been having some trouble with the anisotropic specularity. Dyer’s hair setup was a bit more complicated than Danforth’s, largely due to his very stylized, swooshy hair. His eyebrows are VRay fur just like Danforth’s, albeit a bit less polished as I spent less time on them. They’ll be cleaned up in the next draft. 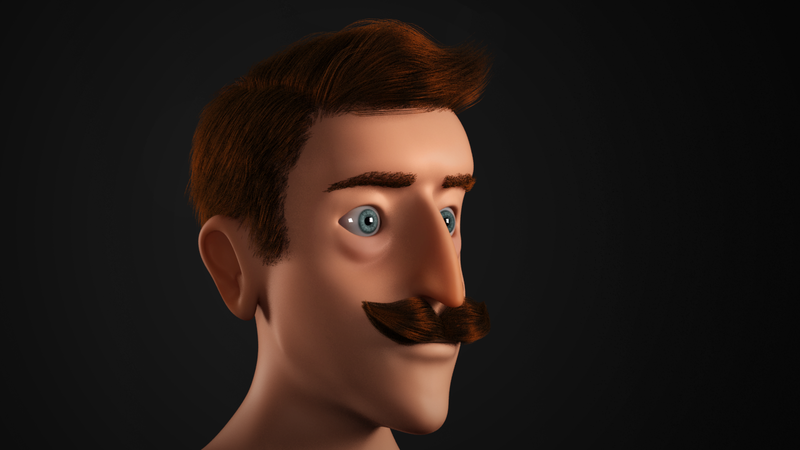 Dyer’s hair and mutache were created in xgen, a plug-in which I’ve found to be simultaneously rewarding and infuriating to work with. Xgen is buggy as hell and crashed upwards of 20 times while I was trying to groom the hair primitives, but the grooming tools are soooo easy to work with. I eventually got a result I was happy with, exported the xgen primitives as curves in a .mel file, and used the curves to drive an nHair system. I haven’t played at all with the simulation settings; I was just concerned with creating a static hairdo that I was happy with for this week. Positive Stuff: I think Dyer’s hair swoop came out nicely, for a first try! I still need to run these images past the team for critique, but I think we’re off to a good start with these.